Home Expert Advice Skincare Advice Acne & Breakouts Do Blackhead Strips Really Work? Stick-on, peel-off pore strips are popular among people who want to get rid of their blackheads quickly, or at least it seems that way. There’s something oddly satisfying about applying a strip, then peeling it off to see all the gunk that’s been hiding in your pores. Although initially satisfying, those blackheads inevitably come back, so you have to go through the process all over again sooner or later. Is that just the way things are, or is there a better solution? We think you’ll love knowing what really helps, but first: How do pore strips work? There’s no secret science behind the way pore strips work. They’re composed of a cloth or cloth-like material that has a strong adhesive on one side. Wet the adhesive, apply it to the area where you have blackheads (nose, chin, or forehead), let it sit a few minutes, and then remove it and see the results, which often appear as dark, hair-like blackhead “plugs” stuck to the strip. There’s nothing quite like an instant (and, let’s face it, kind of gross) fix! The problem is that this fix isn’t really a fix at all. Yes, those are blackheads on the pore strip, but they’re only the surface of the problem. The only thing that comes off when you use a blackhead strip is the top layers of old skin, as well as the oxidized oil, which appears dark. 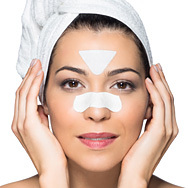 The real cause of blackheads lies much deeper in the pore, which means using pore strips is an incomplete process, like mowing over weeds in your yard rather than plucking them out, roots and all. It’s also worth noting that the adhesive on most pore strips can cause skin irritation, and some pore strip formulas contain drying or aggravating ingredients, like menthol, camphor, alcohol, or witch hazel. Irritated skin often leads to increased oil production, which means that over time you might wind up seeing more blackheads, not fewer. Begin with a gentle cleanser free of harsh ingredients. Anything that leaves skin feeling tight and uncomfortable is likely drying out your skin. Avoid use of overly emollient moisturizers on blackhead-prone areas. Use a well-formulated leave-on salicylic acid (BHA) exfoliant. BHA is distinctively helpful for blackheads because of its ability to penetrate through oil to reach deep down into pores, where blackheads start. BHA also helps shed built-up dead skin, and has calming properties to help reduce the appearance of redness. Use mild, oil-absorbing products to cut down on excess oil on the skin’s surface. A clay mask like our SKIN BALANCING Oil-Absorbing Mask or a mattifying product like SHINE STOPPER Instant Matte Finish with Micro Sponge Technology can work wonders. If you’re dealing with blackheads and white bumps, check out our article that explains what those bumps are and how you can address this bothersome concern, too.